We’ve created the ultimate #GoodTemptation shake. Make sure to tag us @oppobrothers and use the hashtag #GoodTemptation if you try it yourself! Add all the ingredients to a blender and mix until smooth. Simply add a scoop of protein powder if you’re wanting to make a protein shake. Here’s how to core your Oppo tub with a delicious sauce of your choice. Simply use an apple corer to remove a cylinder of ice cream and replace it with the sauce of your choice. Place back in the freezer and once the core is solid, the ice cream is ready to eat! 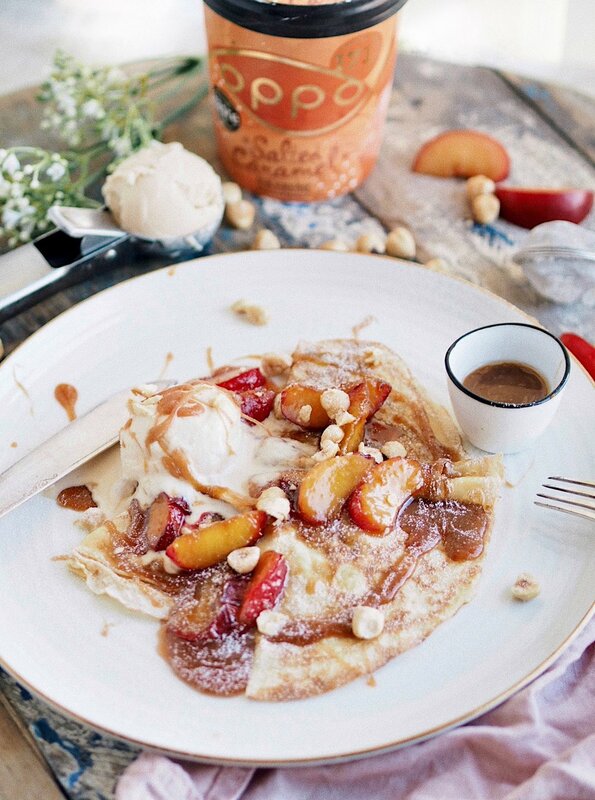 @into.trends has created these beautiful French pancakes. They’re easy to make, require only a few ingredients and go perfectly with our Salted Caramel ice cream. Place the flour in a large bowl and make a hole in the middle. Whisk the egg into the flour then gradually whisk in the milk to form a smooth batter. Heat a little oil in a 18–20cm frying pan (or pancake pan). Pour in half a ladle of batter, thinly coat the base of the pan and cook for 1–2 minutes. Flip over and cook for another minute. Repeat to make 8 pancakes. Heat the butter in a large frying pan. Add the peach wedges and fry for 3 minutes until they begin to soften and turn golden. Stir through the honey and sprinkle over the brown sugar. Continue to cook for a further 4 minutes until sticky and glazed. Place 2 pancakes on a large plate, top with a scoop of Oppo Salted Caramel ice cream. Drizzle over any sauce left in the pan and top it with hazelnuts before serving. These light and fluffy pancakes are a great way to enjoy a healthy, protein rich breakfast. And topping them with Oppo makes for a truly delicious start to the day. You could even try using melted Oppo instead of milk in the batter for an extra indulgent twist. So, get that frying pan ready and follow these easy steps! In a blender, combine the egg, banana, oats, milk (or melted Oppo), spice and salt and blitz until thick and combined. In a non-stick pan, heat 1 tsp coconut oil and then pour in the mixture to make disks about 10cm in diameter. Cook until you see the pancakes start to bubble and then flip them and cook for a further 2 minutes or until golden brown. Repeat with the remaining mix. Layer your pancakes with chopped banana , cacao nibs, raspberries and big scoops of Salted Caramel Oppo ice cream. Any other toppings you wish! 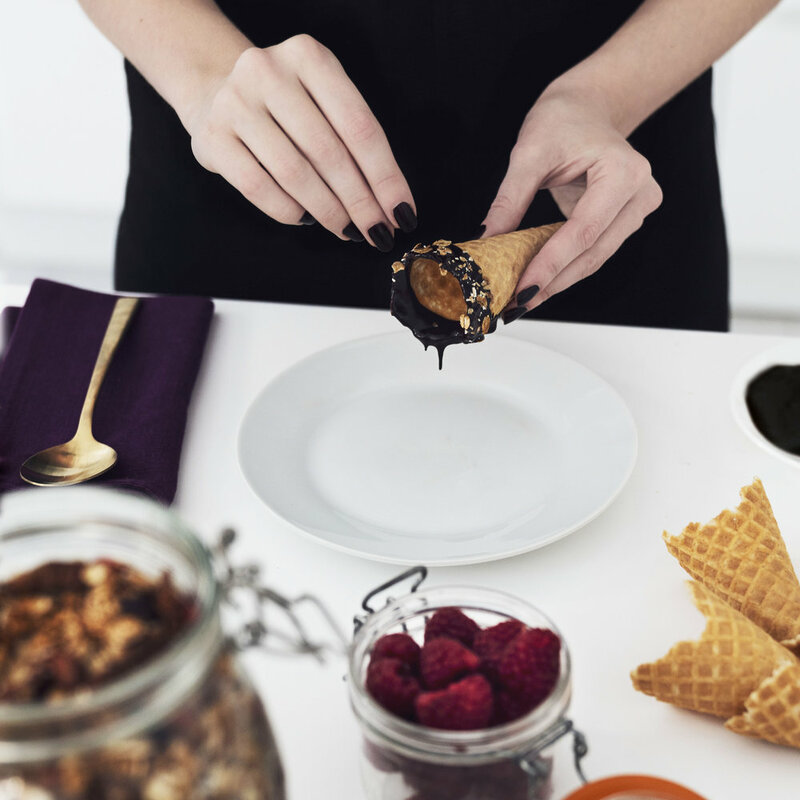 Get your cone and dip it into the chocolate so there is a band about 1 inch deep, then dip into the nuts and other toppings so it is coated. Put into the freezer for 10minutes to set the chocolate and serve with a large scoop of Oppo! @Sarahshealthybakes has made the ultimate wintery #GoodTemptation treat. Have a go and tag us in your bakes! 1. Preheat the oven to 170 degrees. 2. Mix together the flour, salt and bicarbonate of soda. 3. In a separate bowl beat together the coconut oil and coconut sugar, then add the vanilla extract and the egg, beating again to incorporate. 4. Fold in the flour mixture, then once it’s all mixed in, fold in the chocolate chips. 5. Spoon the dough into a greased skillet. Bake in the oven for 20-25 minutes. 6. Leave to cool for a couple of minutes before serving with scoops of your favourite Oppo ice cream! @into.trends has created the ultimate festive #GoodTemptation treat. Warm gingerbread men sandwiches with melting Oppo ice cream inside. Bliss. In a large bowl, cream the butter and brown sugar together until light and fluffy. Add the egg, then molasses. Add the flour, ginger, baking soda, cinnamon, cloves and salt; gradually add to creamed mixture and mix well. Cover and refrigerate 2 hours or until easy to handle. Remove the dough from the fridge and on a lightly floured surface, roll dough to the thickness of a £1 coin. Cut with a floured gingerbread-shaped cookie cutter. Place on a baking sheet and bake 8-10 minutes or until edges are firm. Remove to wire racks to cool. With the same cookie cutter cut out ice cream shaped men and freeze on a baking sheet at least 1 hour. When ready to serve, remove the ice cream and sandwich it between the gingerbread men to make your Festive ice cream sandwiches! Decorate with icing sugar, coconut snow and festive ribbons. 2 In a large mixing bowl, whisk egg. Add then stir in the almond butter and coconut sugar with a spoon until batter is fully mixed. 3 Add the cinnamon, baking soda, vanilla and salt to bowl. Mix again until all the ingredients are combined. 5 Place in the oven and bake for 10-11 minutes or until the edges start to brown. Let cookies fully cool on the pan. 6 Add one ice cream scoop of Oppo ice cream (any flavour) onto the base of one cookie. 7 Sandwich another cookie on top of the ice cream and smooth the edges with a knife.